HomeEuropean Antibiotic Awareness Day: how do we get out of this mess? European Antibiotic Awareness Day: how do we get out of this mess? A report from a Lancet Infectious Diseases Commission chaired by Prof Otto Cars examining the need for global solutions, which was published yesterday. The 2013 G8 Summit, which had a strong focus on antibiotic resistance. Dr Brad Spellberg gave an inspiring lecture at ID Week 2013 based on some high-profile recent publications in the New England Journal of Medicine and Clinical Infectious Diseases. 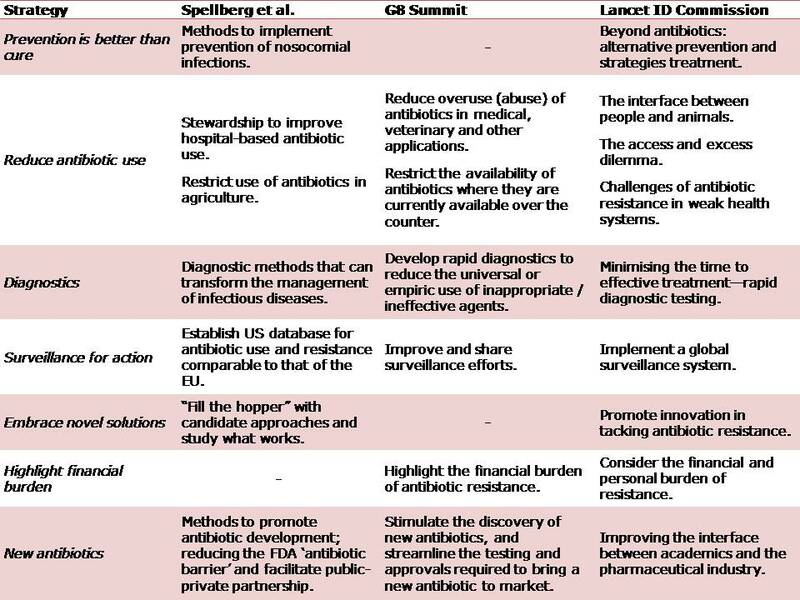 Table: Comparing strategies to curb antibiotic resistance. Prevention is better than cure. We have a reasonably good understanding of what works to prevent the spread of many hospital pathogens, so we need to implement effective strategies. However, there are still important questions about what works to prevent transmission, particularly outside of hospitals, so this area should be prioritised for research. It seems to me there’s an imbalance in the Lancet ID Commission report between prevention and treatment, with a disappointing lack of focus on prevention. 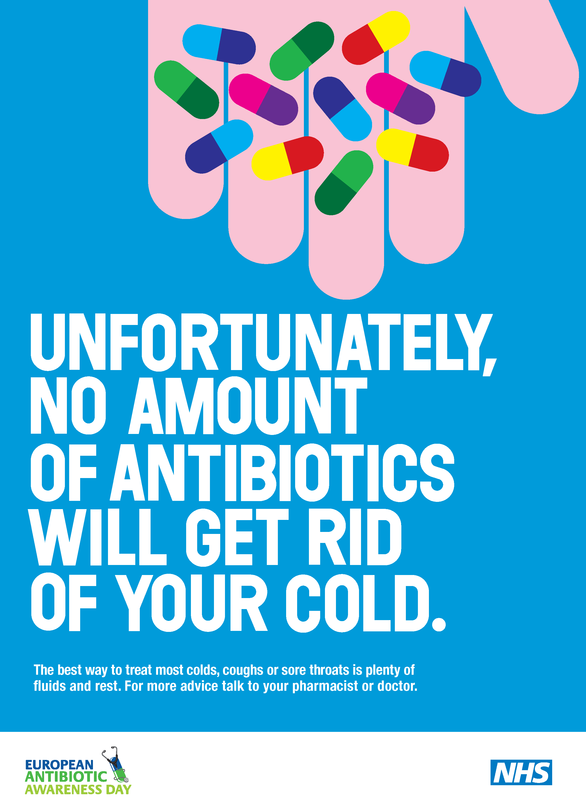 Reduce antibiotic use. Stop selling antibiotics at the cost of Smarties. Otherwise they will be consumed like Smarties. Improve diagnostics. Targeted use of the right antibiotic will help to reduce inappropriate and empiric antibiotic use. The proposed universal use of antibiotics does not fit well with this. Implement effective surveillance for action. I very much like the idea of a global antibiotic resistance surveillance network proposed by the Lancet ID Commission, and, in the mean time, a US national ‘EARS-Net’-like network. Embrace novel approaches. Table 1 in this open-access NEJM article outlines the key novel approaches available, and their current status in terms of research. Highlight the financial burden of resistance. This comes low down the list for me, not because it’s unimportant, but because the burden of resistance is now pretty well characterised. Facilitate the development of new antibiotics. Perhaps somewhat controversially, I’ve listed the development of new antibiotics at the bottom of the list. Most bacterial targets have now been covered and even if we do succeed in bringing truly novel antibiotics to market, resistance will emerge eventually. The noises coming from the global opinion leading healthcare authorities, such as ECDC, CDC and national Departments of Health give me some confidence that the problem of antibiotic resistance is at least now firmly on the agenda. Furthermore, the fact that the solutions mooted by the G8 politicians align closely with those proposed by the expert academics is encouraging. However, the challenges of antibiotic resistance will only grow is left unchecked. We are facing a complex, multifaceted problems, which demands a complex, multifaceted solution. In the pre-antibiotic era, prevention was all we had and we may be there again before too long. Good on you for standing up for improved diagnostics and antibiotic stewardship. These causes can certainly be very unpopular with hospital administrators. All the best with your search for work.